Pro Football Spot’s Josh Gleason talks to five professionals about who they consider the top quarterbacks are in the 2014 draft class. 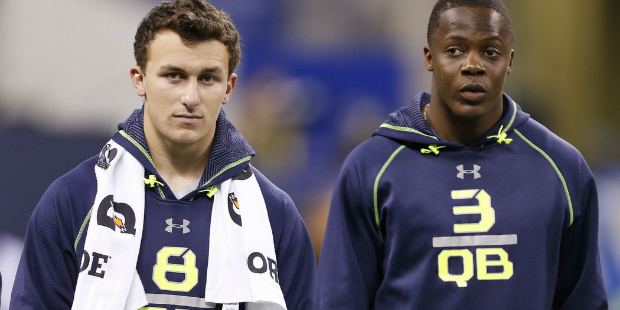 The group of quarterback prospects for the 2014 NFL Draft is one of the most polarizing in recent history. If you talk to five people, you could likely get five different answers on which the top quarterback in this NFL Draft is. I decided to ask five individuals whose job is to know the quarterback position inside and out. A few of them also worked closely with some of the prospects in this Draft. Quarterback trainers Donovan Dooley, Todd Krueger, Ken Mastrole, Steve Calhoun, and Steve Clarkson all took time out of their schedule to discuss the quarterbacks in this NFL Draft class. The Walter Payton Award winner was on two of the guru’s board including receiving a second-place vote from Steve Clarkson. “I think he is a sleeper. I think he had tremendous success at the FCS level. Success at the senior bowl and a live arm.” – Todd Krueger who rated Garoppolo fifth. One of four quarterbacks to receive a top five placement by four of the five gurus, the new Raiders signal-caller was Steve Calhoun’s top quarterback. While Todd Krueger did not comment on Carr’s play, he did say that he had a chance to talk with the Rutgers coaching staff who all said Carr was very impressive. The polarizing former Heisman Trophy winner did not receive a single first-place vote but finished fourth or higher in four the five gurus rankings. The only quarterback to appear on every gurus board, opinions of Bridgewater as another polarizing prospect was evident among this group. He received one first-place vote from Ken Mastrole while received a second, two thirds, and one fifth place vote. The top quarterback selected in the NFL Draft and tops in this list did not appear on all boards, but garnered the most first-place votes (three) to go along with a second-place vote. Blake Bortles is your top quarterback this year among the Quarterback Gurus and here are what they said about him to conclude this year’s edition of this article.